Just two weeks earlier, he’d been the coordinator for the week-long German Genealogical Research track at the Genealogical Research Institute of Pittsburgh.3 In May, he’d been one of the speakers at the National Genealogical Society conference in Cincinatti.4 A nationally known author and lecturer on German and Pennsylvania research, John was teacher, mentor, friend to many genealogists. And news of his death, at age 64, comes as a shock to all who knew him and a blow to the entire genealogical community. 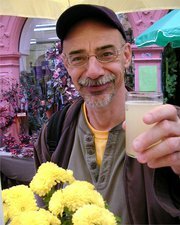 John Thomas Humphrey, age 64, passed away suddenly of a stroke on August 12, 2012 in Washington, D.C. He was the son of the late David and Edythe Humphrey of Pen Argyl, PA. John was graduated from Pen Argyl High School in 1966, and was graduated from American University with a BA in government and public administration in 1970. He is survived by his sister, Joan E. Mack (nee Humphrey), nephew Jonathan Mack, niece Jennifer Mack, and John Doney, his partner of twelve years. Soon after college John began renovating townhouses on historic Capitol Hill, eventually completing more than twenty properties. John transitioned to professional genealogy, and compiled the fifteen volume Pennsylvania Birth Series, authored four books, and innumerable articles. 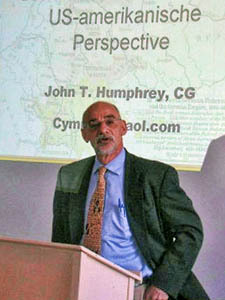 As a certified genealogist, John lectured and taught nationally and internationally on Pennsylvanian, German, Welsh and Moravian ancestry, and could read and write old German typeface. In addition to his love of genealogy, John ran more than twenty marathons, enjoyed worldwide travel, and the endless devotion of his Polish Lowland Sheepdogs and Labrador Retrievers. A public viewing will be held on Thursday, August 16, 2012 at 9:00 A.M. at the Guerro & Ruggiero Funeral Home in Pen Argyl, followed by interment at Plainfield Township Cemetery. We can add to it accomplishments that mean the most to our community: John was an award-winning author who specialized in German and Pennsylvania research. 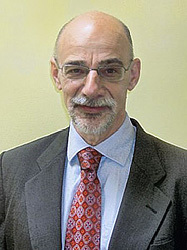 In 2010 he was invited to give a presentation on researching Germans in America at Schloss Dhaun in the Rhineland-Palatinate; in 2008, at the request of the German Embassy, he gave the keynote address at the 400th Anniversary Celebration in Williamsburg, Virginia commemorating four centuries of German immigration into the United States. He was the past president of the Mid-Atlantic Germanic Society, a past vice president of the Genealogical Society of Pennsylvania, leader of the National Genealogical Society German forum and former director of the NGS Learning Center. What doesn’t show up in any of those words are his kindness, the depth and breadth of his knowledge, his willingness to share what he knew and, above all else, that enthusiastic “c’mon along, this is fun” smile. It simply wasn’t in him to see family history as anything other than an exciting journey, one he loved best when sharing it with others. He had an easy, graceful, gentle style even when dealing with complex materials, and no matter how tough the questions were, John always delivered the answers with that smile. The loss of a genealogical scholar of John’s caliber is a terrible blow to our community. Yet we have cause to be grateful — grateful for his time with us, grateful for all he shared with us, and grateful above all else that he lived when he did. Because he lived when he did, his work — his genealogical legacy — lives on. • John T. Humphrey, “Palatine Origins of Some Pennsylvania Pioneers,” National Genealogical Society Quarterly 89 (June 2001): 152-153. • John T. Humphrey, “A Rhoads Family History: The Family and Ancestry of Jay Roscoe Rhoads with a Genealogy,” National Genealogical Society Quarterly 91 (March 2003): 69. • John T. Humphrey, “Minimum Resources, Maximum Yield: Reconstructing the Schuck Family in Eighteenth-Century Pennsylvania,” National Genealogical Society Quarterly 91 (September 2003): 165-182. But the written word could never capture what John had to offer as well as his spoken words did, and because John lived when he did, we have his spoken words as well. First, you can see him in Finding Your Family at the National Archives, and he’s featured in a 20-25 second clip in the National Genealogical Society’s Paths to Your Past (starting at about 01:58). And because he lived when he did, his lectures live on as well. Starting as far back as the early 1980s, various genealogical groups including the National Genealogical Society arranged for lectures at their conferences to be recorded. When John began speaking widely at those conferences, starting in 1997, his lectures were recorded too. • Finding German Ancestors Using Church Records in Germany and the U.S.
Just enter “Humphrey” in the search box to find these lectures. • F 321- Midwest	German Immigration, Migration and Settlement Patters within the U.S.
• S458- German Ahnentafeln by the Thousands! To order any of these, go to the link for the specific conference and, in the drop down box for available options, find the entry with the code shown to the left of the lecture title. Jambs was offering a boxed set of four lectures (Finding Your German Ancestor’s Place of Origin; Researching 18th Century Germans; German Church Records: the Heart and Soul of German Genealogy; and WWW of German Genealogy) for $45 at the NGS Conference in Cincinnati6 and although it’s not specifically offered on the website, an inquiry via the contact link may well produce it. I’ve been reminded recently of that African proverb, spoken of those whose knowledge goes with them to the grave: “When an old man dies, it is as if a library is burnt down.”7 And though our hearts are heavy, all we can say is… Thank you, John, for leaving so much of your library with us here to share. As always, Judy, you have hit it out of the park. Thank you for helping us remember John. It’s a tragic loss to our community, but you are right. He’ll continue to teach and reach the future. I’m so grateful that I knew him, and so grateful for what he’s left us to carry on with. This is a terrible loss to all of us. I was in his class in Pittsburgh just weeks ago. He gave wonderful help on another way to decipher German script by starting from the last letter in a word and going backwards because capital letters often are the most difficult. His lectures could be applied to other groups where records are not readily available. He was knowledgeable on all areas of Germany not just two or three old kingdoms. I didn’t register soon enough to be in the class at Samford last year but I am so glad I got in at GRIP. He did a wonderful job of combining history and genealogy. So glad you had the chance to learn from him, Pam. As a fellow board member of John’s for the Mid-Atlantic Germanic Society I can say your memorial to him was on point. Working with John on this board was great fun and he helped us accomplish so much in the past twelve years that I’ve been involved. John was a great friend and mentor to me and it will take some time for me to get over his death. If I know John he’s counting all the Germans and then some in heaven right now! I am a board member of MAGS also. I took the liberty of copying your wonderful tribute, and taking copies to John’s favorite restaurant, Cafe Berlin tonight. The owner and staff was very appreciative. I just saw him there last week. He will be missed. That’s the kind of copying for which my permission can always be assumed, Roy. He will certainly be missed, Carla. What caught my eye was that in his obituary his partner was mentioned last. In a straight obituary a husband or wife is mentioned first, then children, then siblings, etc. I guess his sister wrote the obit. And of course in a perfect world it wouldn’t be partner, but husband. I’ve often wondered why professional genealogy attracts such a high disproportionate amount of gay people. I don’t think you can make any assumptions here (as indeed we should never make assumptions in genealogy). But I certainly and absolutely agree with you that, in a perfect world, the relationship of any person in a committed relationship with any other person would be, simply and uniformly, spouse. I agree with Martin and Judy, I met John’s partner on several occasions. My heart and sympathy goes out to him. When my time comes, I hope my partner of 40 years will be treated properly….. I think he will. We can hope that our deep sympathy for his loss helps convey the esteem in which we all hold his partner, Roy. That’s all the comfort we can offer at this point. So well put! I am so grateful for having known and learned from John for the past 11 years — from the NGS Tour of Northern German Archives in 2001, numerous conference lectures through the years, and last month at GRIP. He leaves a huge void. It certainly is a real loss, Pam. Thanks, Malissa. Sure is a loss. The old saying goes “you never realize what you lost until it is gone.” I have worked with John over the past several years on the Mid-Atlantic Germanic Board and always valued his knowledge and expertise. When I heard of his death I was so saddened not only for my loss of a friend, but for the genealogical community as a whole. I did not think we would lose him so soon. John was a kind and giving person, who always had time to answer a question and help someone. I feel blessed to have known him and worked with him. I will continue to miss him, but am glad–as you so adeptly pointed out Judy–that he left us a legacy in his books and lectures. Thanks Judy for a heart-felt tribute to a wonderful man and genealogist! It really is just so hard to believe he’s gone. I am sorry that I did not ask first, before copying your article. I should have! With your permission, I would like to copy again and make copies available to the members coming to the October MAGS meeting. I am sure they will be appreciated. You can reply to me directly if you wish. You absolutely may have permission, Roy.